WHY DO WE CALL PRIESTS “FATHER”? 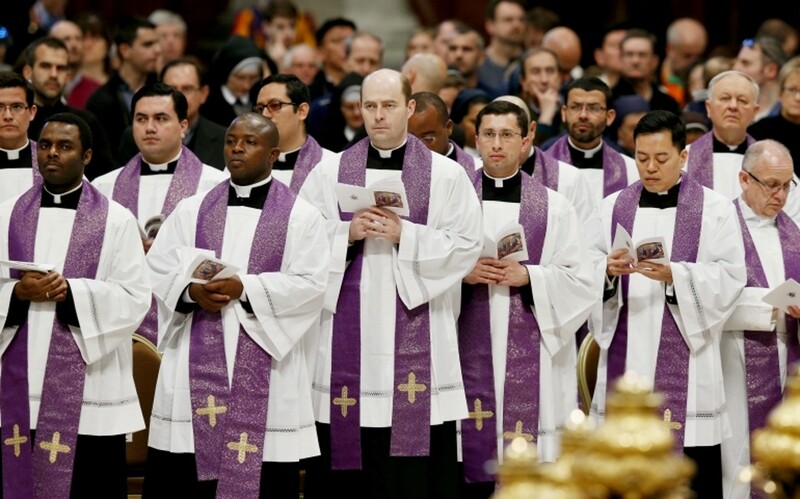 Why Do We Call Priests "Father"? Often non-Catholics ask, “Why do Catholics call their priests "Father"? They then cite Matthew 23:9: "You must call no one on earth your father." How should you answer? A Catholic might respond, "How do you refer to your mother's husband? What do you call him?" If a Catholic is wrong in calling his priest "Father," then everyone who refers to his own natural father as "father" is also in the wrong. Both usages would be prohibited by a literal interpretation of Jesus' words. Jesus came not to abolish but to fulfill the Law of the Old Covenant (Mt 5:17). If in Matthew 23:9, He literally forbids us even to acknowledge our natural fathers as our fathers, how can we keep the fourth commandment ("Honor your father and your mother")? Taken literally, Jesus' words in Matthew 23:9 contradict His claim in Matthew 5:17, but we know that the Son of God never contradicts Himself. Look again at the passage in which Jesus says we must call no one "father." In contrast to the attitudes of the Pharisees and others, Jesus is specifying the qualities Christian leaders must exhibit (Mt. 23:1-12). The Pharisees aspired to being called "rabbi" (or "master" or "teacher"). Among the schools headed by teachers called "rabbi," there were divergences of belief, some of them in actual contradiction. A similar situation prevailed regarding the term "father" (in Aramaic, abba, a title of honor). The title was given to well-known Jewish religious authorities of the past. As with "rabbi," so with "father." The term designated the progenitor of a particular, even contradictory, interpretation of the Jewish faith. Why did Jesus declare that no Christian leader is to be called "rabbi" or "father"? He was telling us that no leader may set up his own interpretation of the Catholic faith and seek followers for his opinions. The role of leaders in Christ's Church is faithfully to hand on Christ's teaching received through the apostles (Mt. 28:19). The words of the apostle Paul epitomize the essential attitude of the Christian teacher: "This is what I received from the Lord and in turn passed on to you" (1 Cor. 11:23). Paul writes to the Church at Corinth, condemning "these slogans you have, like 'I am for Paul,' 'I am for Apollos,' 'I am for Cephas'”(1 Cor. 1:12). The history of Protestantism is essentially the story of this very process—the unending proliferation of sectarian groups, saying "I am for Martin Luther" or "I am for John Calvin" or "I am for John Wesley." The World Christian Encyclopedia (David B. Barrett, ed. ; Oxford, 1982) reported that in 1980 there were 20,780 distinguishable Christian denominations in the world. Moreover, at the time the encyclopedia was published, an average of 270 new denominations were springing up each year—more than five every week. If that rate has continued, then there are over 25,000 denominations today. Every single one of these competing, contradicting denominations was formed by some person who said, in effect, "Call me 'Master,' call me 'Teacher'; I will tell you what the Christian truth is!" Jesus foresaw this problem and provided the means for avoiding it. In the passage under discussion, He tells us, "You have only one teacher, the Christ." And how are we to be taught by our one Teacher? By the means He provided. He founded the Church on the apostles and their successors, with a special role for Peter, the Rock, the earthly head of the Church. A Catholic knows that when the Church Christ founded speaks solemnly, Christ Himself is speaking through her to each member. Every follower of Christ wants to know the truth, for "the truth [and only the truth] will make you free" (John 8:22). For acquiring that truth in its fullness, the Catholic Church established by Jesus Christ offers the only alternative to the chaos of ever-expanding denominationalism.